It’s official, custom power banks are now a must have promotional giveaway since 100% of Apple and Samsung phones now have Qi wireless charging capability. As smartphones become more prevalent, it only stands to reason that keeping them charged will become more important. Virtually everyone has a cellphone of some kind in this day and age, which is why custom mobile charging devices make great promotional gifts or incentives. For starters, promotional portable charging devices kill two birds with one stone: they provide your clients with a gift they will want to use and they also give you a prominent canvas to display your logo or branding. As the workplace gets younger and more tech savvy, it is becoming increasingly important for brands to provide promotional products that appeal to a more youthful demographic. 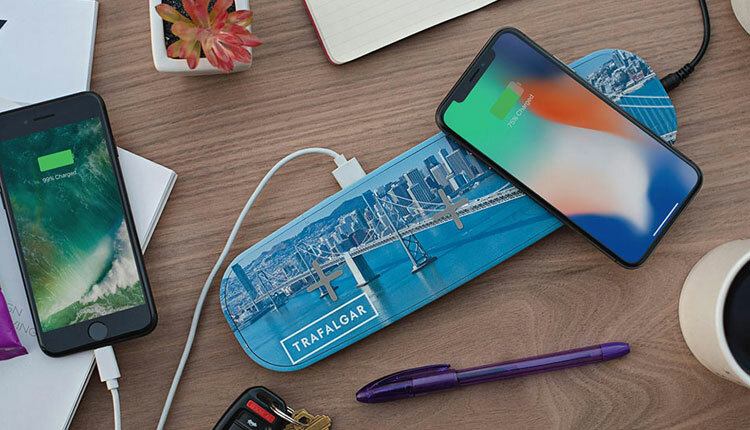 Non-tech promotional gifts are still great for many audiences, but a custom mobile charger is innovative and more tailored to the needs and wants of general consumers. Still, there are a lot of choices when it comes to promotional smartphone chargers, and it may be difficult for you to choose the best option for your intended audience. You may also not be up-to-date on all the newest charging technologies. If you are a standard smartphone user with a limited understanding of new charging technologies, then you’re not alone. That being said, it is likely that you have heard of the concept of wireless charging in some form another (whether you’ve actually used it or not). Qi (pronounced “chee”) technology is a relatively new method for charging phones wirelessly. It’s important to understand, because it is used in a number of portable charging options (though, not all). Essentially, Qi technology is used in charging devices and allows phones to be charged simply by being placed on or near the charger. Qi technology uses a concept called resonant inductive coupling. This is a basically a fancy way of saying that power is transferred from the charging device to the mobile phone. As you may have surmised, Qi eliminates the need for traditional charging cables and USB ports, which is convenient for those who travel or simple don’t want to worry about hauling around yet another cable. The technology was originally introduced in 2012 for Android devices and has since become available for newer Apple smartphones (including the iPhone 8 and X). It should be noted that not all phones are Qi-compatible and not all charging devices come equipped with Qi technology. Also, not all charging devices that employ wireless power transfer are necessarily Qi-enabled. There are several other Qi-like technologies, but Qi is the newest and is quickly becoming the most relevant after Apple adopted it for their newer iPhones. The technology can also be found in a variety of power banks and phone case battery packs, and it is tailor-made for charging pads (all of which we will discuss in a bit). To put it simply, there are many options for custom Qi wireless chargers. Not all audiences are going to be keen on these devices. Obviously, younger groups who are invested in new phones and their charging capabilities will be over the moon upon receiving a Qi wireless charger. But, an older audience who perhaps hasn’t upgraded their phones in years may not be as interested. Of course, there’s no doubt that promotional Qi wireless chargers are universally valuable because they can be sold or re-gifted at the recipient’s discretion. So, even if your audience does not want or use the device, it’s almost a guarantee that it will be used by someone else. Branded power banks represent one of the most common options for promotional charging devices. But, what exactly are they? As their name suggests, power banks allow you to “bank” electricity in the device to charge your phone later without the use of a traditional electrical outlet. Usually, power banks require users to charge them in a regular wall outlet. Once the devices are fully charged, they can be unplugged and taken anywhere. Most power banks can charge a phone in full at least once. Higher capacity models can get certain phones back up to 100% as many as 7 times before you need to recharge the power bank. Most custom power banks are equipped with at least one USB port and some models come with more. Some power banks even come enabled with Qi technology while also incorporating USB ports. Obviously, the latter option covers both the tech experts and the novices because it combines new and old charging methods. Custom multi-function wireless chargers are also just cool. The two most prominent companies for promotional power banks are Anker and mophie (stylized in lowercase). This is partially because they provide the highest quality for your prospective customers and partially because they offer the most power bank options. Of course, there is no shortage of choices and price options when it comes to custom power banks at iPromo. Some are even as small as a conventional lipstick tube. Although most power banks require the use of a USB cable, they are still a convenient option to dole out as a promotional gift. Everyone with a smartphone will be able to use them, and they will obviously use them a lot. Unlike power banks, charging pads almost exclusively use Qi technology or other tools like it. These chargers typically have a rounded surface allowing you to conveniently place your phone on top and receive a charge. Typically, custom wireless charging pads come with a traditional plug-in and do not operate like power banks. Some models, like the Boost Qi Wireless Charger, allow you to dispense with wires of any kind. For a certain demographic, this can certainly feel like a boon. Imagine being able to pull out a small disc from your purse or jacket pocket to give yourself a charge at a moment’s notice. There’s no need to plug anything in at all. Of course, again, this only works with Qi-compatible devices. Still, promotional wireless charging pads also have value regardless of who gets it. Even someone who has never used a smartphone in their life will end up re-gifting or selling the device to someone who will use it a lot. Obviously, that’s one of the primary benefits of all custom mobile charging devices: they will be seen. These devices are designed to be used not only outside of the house, but in public surrounded by people. Your brand is bound to get a lot of impressions. What are Phone Case Battery Packs? mophie calls them “juice packs” but phone case battery packs are essentially mobile charging devices that serve a dual purpose as a phone case. They look very similar to any standard phone case while infusing the phone battery with life-saving energy. The mophie models offered at iPromo are available exclusively for a specific set of iPhones. These devices plug into the charging port on the iPhone and provide a steady stream of battery life. They are a lot like power banks except that you don’t need to carry anything separate around with you. The charger is already around the phone. Apple itself has a line of battery cases that are actually Qi-compatible. So, for Qi-enabled iPhones, you can avoid the ever so slight inconvenience of having to affix a connector to the charging port. Again, like other charging options, custom battery cases are eminently useful, provide a lot of value to the consumer, and are certain to improve your brand’s favorability. They also might just be the most visible option. Most people carry around their phones everywhere. If those phones have a charging case with your branding on it, you’re more likely to accrue impressions beyond what you could have initially imagined. Clearly, promotional phone cases that double as battery packs may be worth the investment. There are also plenty of standard custom phone chargers to choose from at iPromo if you simply want to ensure that your clients can get a charge while looking at your logo. Wall chargers come in a variety of different styles and colors, including options that have as many as four USB slots. If you want to one-up the competition, the Anker PowerCore Fusion is both a wall adapter and a power bank. Another simple charging solution is a 4-in-1 cable that can charge multiple Android and iOS devices. These are great, because if anyone needs a charger, the person who receives this device will be prepared. It also, of course, allows your logo to be seen time and time again. Other charging devices serve as both a wireless charging platform and a speaker. You can also opt for a simple car charger or even a not-so-simple mousepad (yes, a mousepad) that can charge your phone. There are virtually endless options, all of which your clients are sure to enjoy. Of course, the biggest 2019 trends in custom mobile charging devices are power banks, wireless charging pads, and phone case battery backs. Using chargers that are Qi-compatible is a plus, especially considering that Qi-enabled smartphones are set to see a boom in the market. In the end, it’s hard to go wrong with any charging device, because we all just love our phones so much. If you are interested in having your logo on a technologically-advanced charging device, get in touch with a promotions specialist today.